Tim Sterling stood by his sailboat on the side of the highway by the Purdy sand spit after strong winds blew his boat off its anchors. Tim Sterling stood by the side of State Route 302 near Purdy, the wind blowing into his face, watching his sailboat sitting on its side. 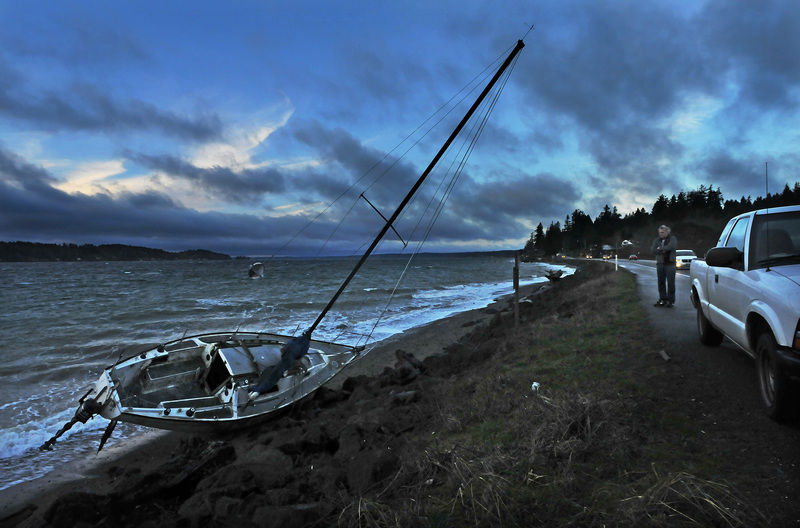 Strong winds blew the 28-foot boat off its anchors on Henderson Bay, washing it ashore on the Purdy sand spit early Wednesday morning. Sterling said he called the Coast Guard because “it looks like a bad shipwreck.” But he said the boat is fine and he is waiting for the next tide to come in so he can put his boat back in the water. His sailboat has been anchored just off State Route 302 in Wauna, Wash. He said the plan had been to get the boat out of the water, but they never got to it. “I didn’t think the wind would be this strong,” he said. “We had two anchors on her” and she still got dragged to shore. “This is probably the best spot for her,” he said as he stood along the highway, the wind blowing his wet gray hair.